Update April 6th 2018. Sometimes in this hobby it feels like ages before you receive the shiny new helmet you pre-ordered and paid for. 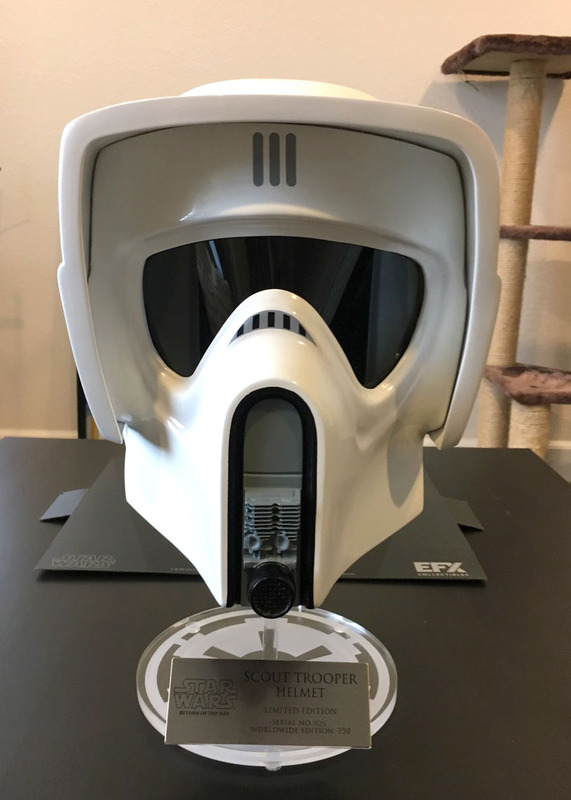 However in the case of the EFX Scout Trooper helmets (Limited and Legend Editions), it really has been. FOUR YEARS IN FACT!!! 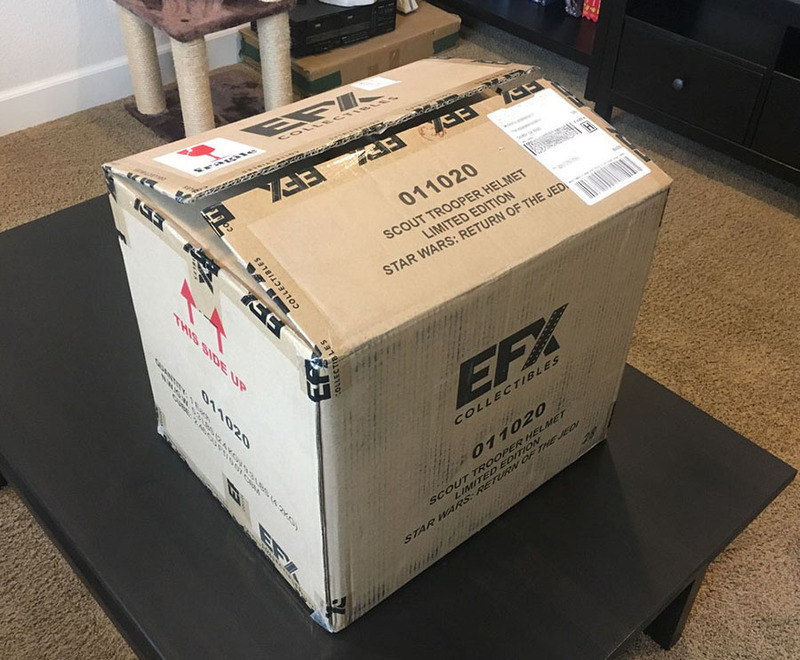 Yes that's how long it took EFX from Pre-Order (cash up front of course) until they finally delivered the "Limited Edition" Helmet. The more expensive "Legend Edition" is still nowhere to be seen (as of Jan 2019) - and is approaching FIVE YEARS! 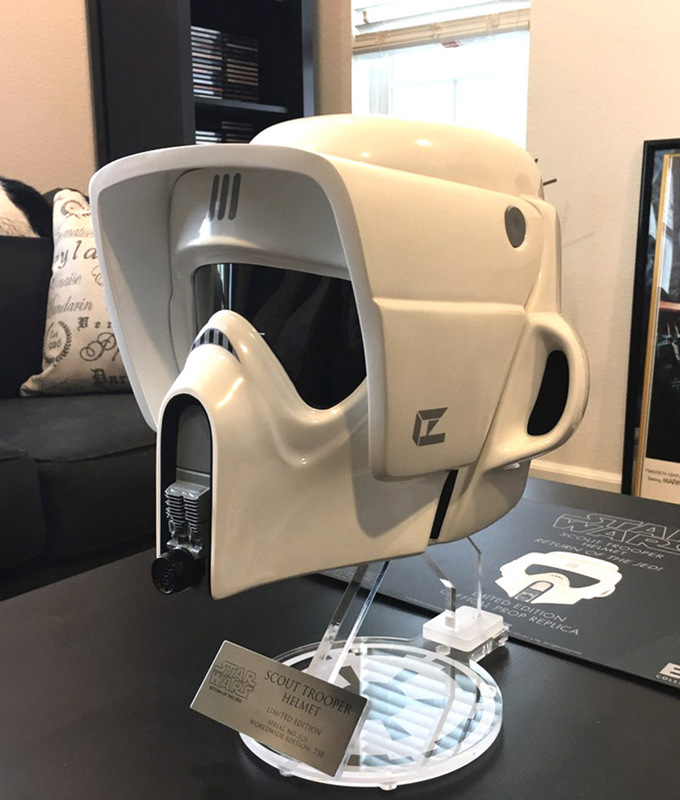 Note that there was still no real news on the more expensive Legend Edition helmets - more of that at the bottom of the page. So a couple of photos to kick off this now hands-on review. Overall as you can see its a decent looking helmet with lineage to the original screen-used helmets - as EFX used the original wooden moulds as their root mould. 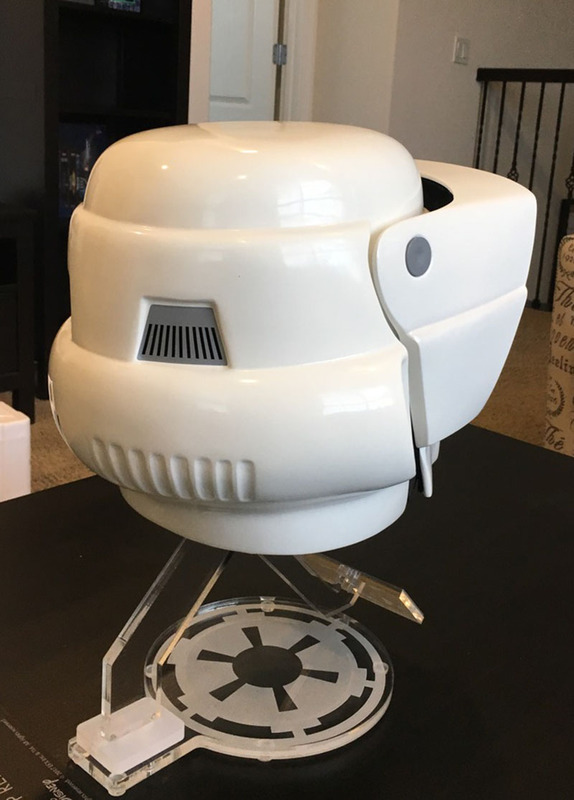 Now its worth pointing out that as the Limited Edition is made from fiberglass, so it was never going to be an exact copy of the originals, which were vac-formed out of ABS/Styrene, so we knew there would be material-driven compromises - but just not this major! So it just seems like the problem is that EFX appears to have just completely ignored the inherent differences of using an entirely different material, and so have ended up with a replica that from certain angles looks decidedly odd and very inaccurate in places. Above a side on view with the helmet sitting on the new light-weight stand (itself a cause for some rumblings). For a start a number of people, including Mike, who provided the non-studio photos in this review, has not been able to completely close the visor shut - leaving an obvious gap. Now its possible that this may loosen over time, we just don't know. 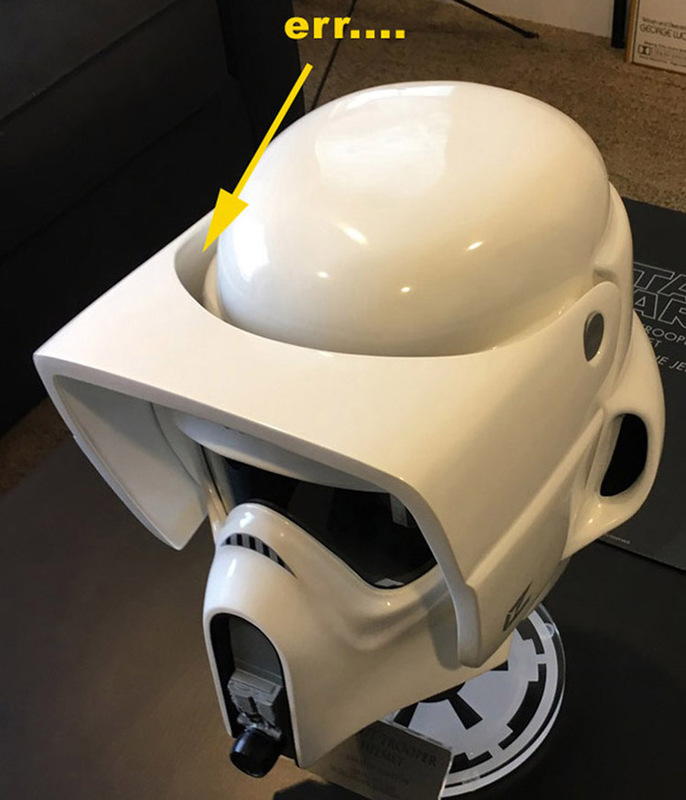 ...as it reveals an absolute chasm between the visor and forehead - so large you could probably lose the Death Star in it! This gap is just ridiculous! 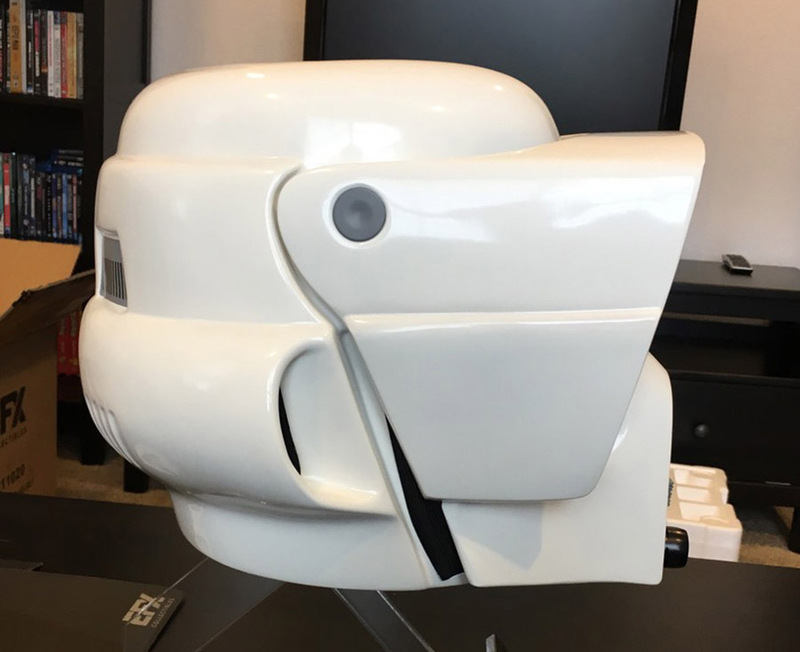 It appears the EFX guys have made no attempt to adapt the design/fabrication to accommodate what is a completely different material (i.e. 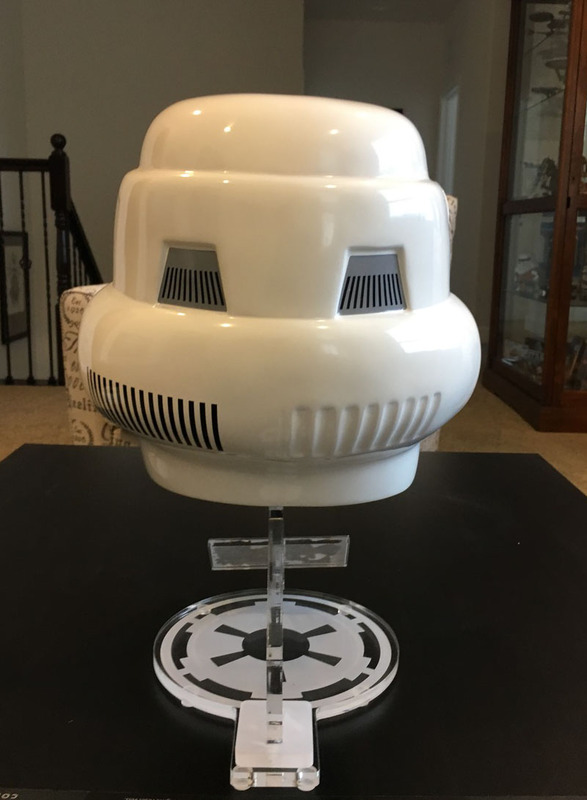 the fiberglass replica vs. the vac-formed plastic original). 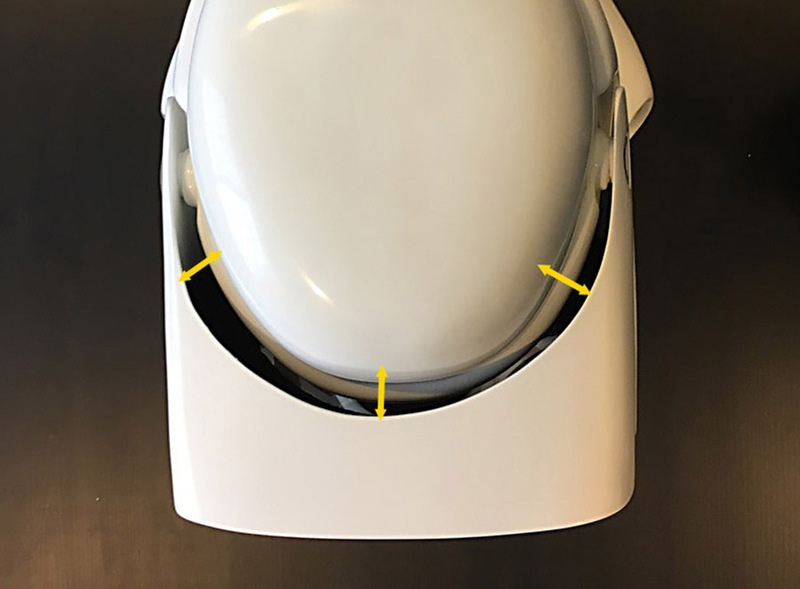 This has resulted in a woefully inaccurate and unsightly gap between the visor and the faceplate. To make matters worse, as seen below this new gap now reveals the moulds underlying ear lugs/visor pivots which look plain ugly. Bottom line is EFX designers/engineers should have modified this part of the Limited Edition mould to accommodate the materials change. Its not like they didn't have the time - they had four years! 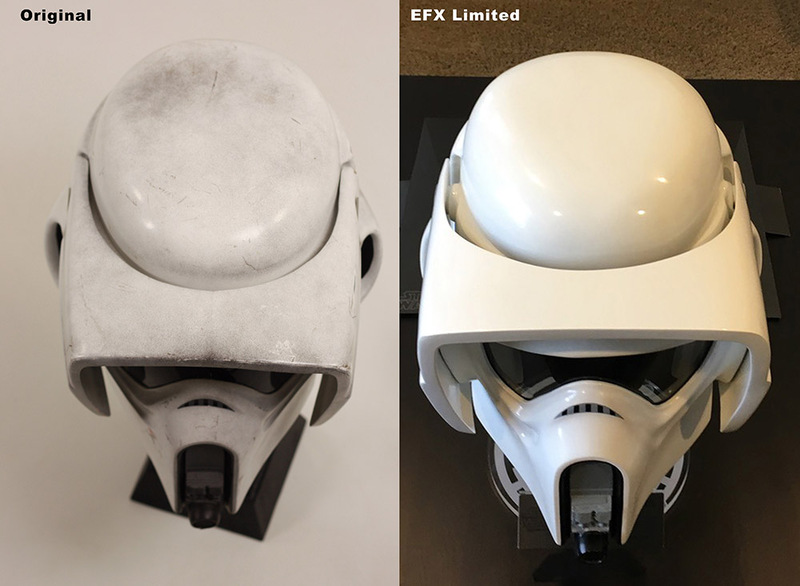 Below a comparison of the EFX against an original screen-used helmet (see here). As you can see the difference really is night and day. Note that the EFX visor is tilted slightly up. This was due to the visor mechanism which is not currently allowing it to fully close. Below - If we move away from the visor issue - a shot from the front is a lot more pleasing. Definition around the eyes looks good as is the snout detailing. However there's clear flaring around the jaw-line which looks decidedly unflattering. As with all the premium EFX helmets its supplied with a numbered metal plaque and newly designed perspex stand. This rear quarter shot shows the three main parts, the cap/back section, the visor and the (unseen) faceplate. On the original screen-used helmets (more photos here) both the back/cap and the visor were formed in two halves and then the vac-formed plastic glued, filled, reinforced and painted into single pieces. 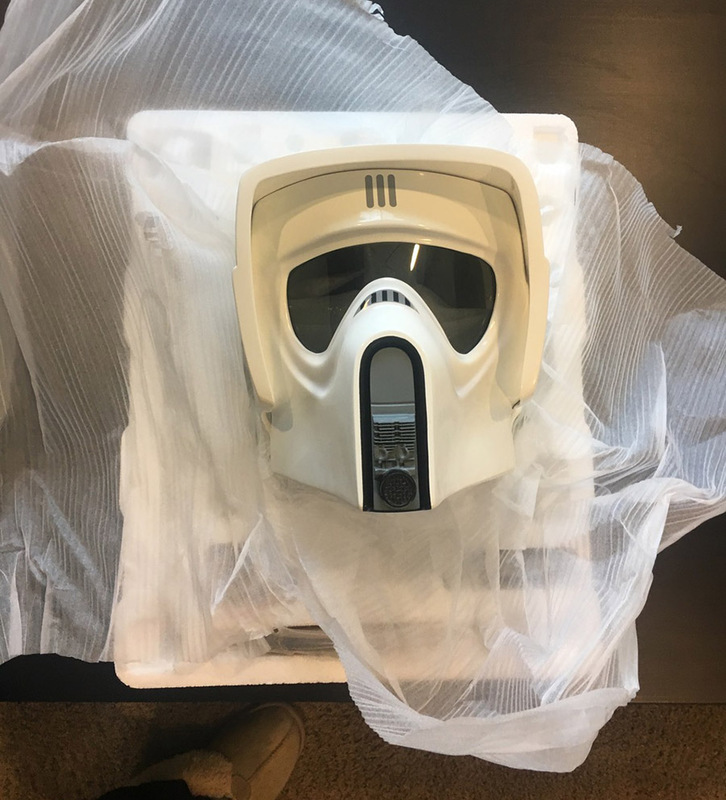 Since this is made from fiberglass EFX has not had to go through that process as has been able to mould single back/cap and visor sections. However, the Legend Edition will need to emulate this if its going to be accurate. Usual view from the rear. No issues from this angle. ..and below the left quarter showing the new, almost delicate looking stand (although given its now a lot lighter than the old stand they may be a little cheaper to ship). ...and finally below another shot of the front again, certainly its most flattering angle. One final point worth mentioning - this helmet is absolutely un-wearable without major modifications: even if your head is small enough to fit it, the weight of the front, combined with lack of hard-hat liner means it drops forwards so your chin lines up with the goggle section! Conclusion: Four years is too long to wait for an average looking helmet with some pretty horrible inaccuracies which EFX simply ignored and instead happily shipped out what were clearly second-rate helmets. Where was the Quality Assurance? 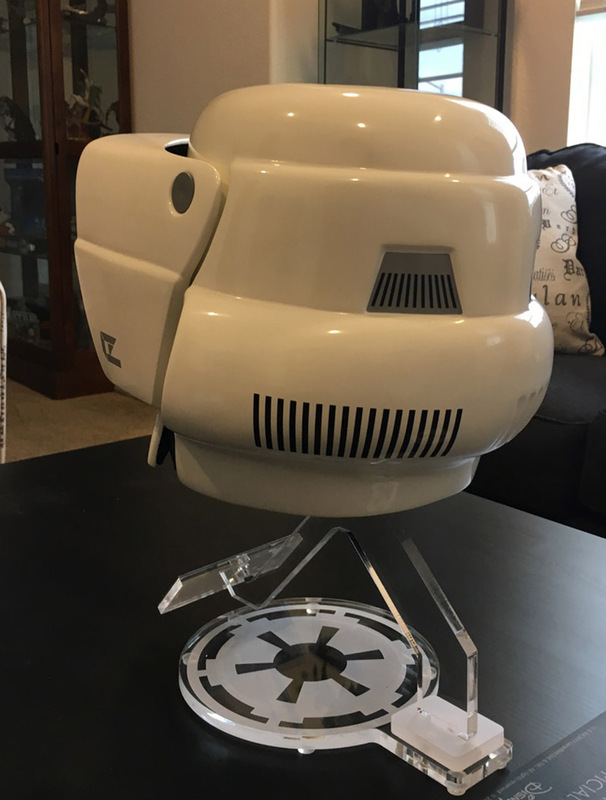 Collectors expect value for money from a $700 replica - and the near four years waiting for this, combined with its glaring faults has understandably left a sour taste in the mouths of many who pre-ordered this from EFX. Despite the time, EFX clearly rushed this - after pressure from their customers compelled Disney to investigate this debacle. 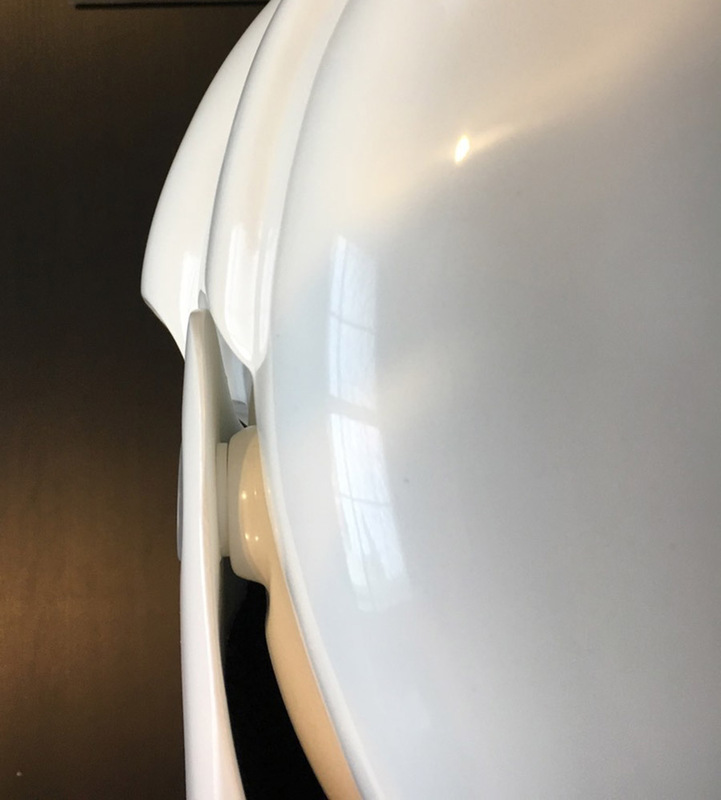 With this helmet EFX has demonstrated its clearly not capable any more of delivering a quality product - leaving us to believe that the even-mmore expensive Legend Edition will be similarly poor. Guess we'll just have to wait! So how does it compare with the other accurate helmets out there? 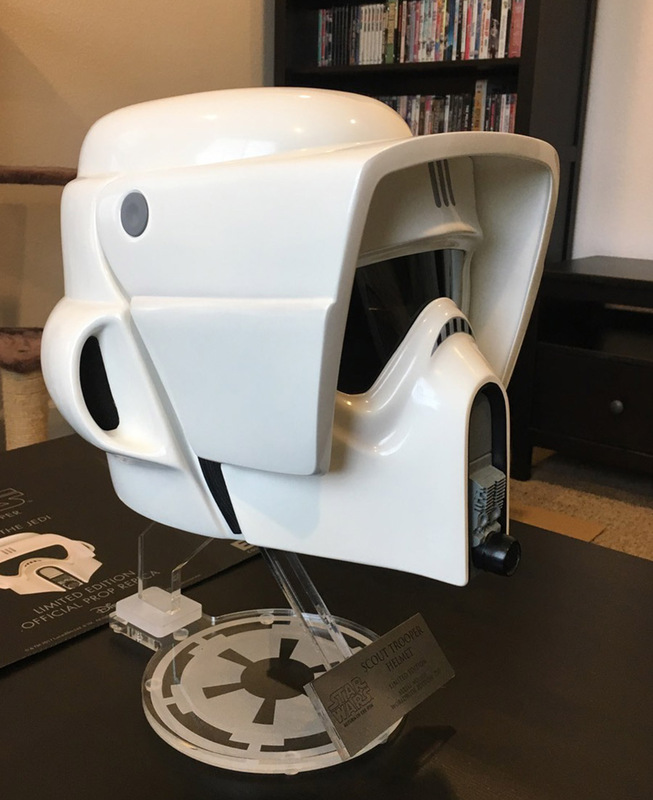 For those who (like us) have pre-ordered the $900 Legend Edition Scout Helmet - Unfortunately there's still no positive news, with EFX indicating that delays are now in part due to their inability to ship the accompanying resin Scout Blaster Pistol, citing Disney's "gun-concern". We think most customers will dismiss such a poor excuse since there are plenty of workarounds (e.g. provide something else, reduce the price, paint the blaster orange etc. etc.). Come on EFX, sort it out!